PPS has now replaced and brought back online the majority of drinking fountains and kitchen faucets in the common areas of most schools. These faucets now meet or exceed PPS water quality standards which are better than those mandated by the EPA. A significant number of classroom drinking faucets were also brought back online. Bottled water use has been dramatically reduced. Each school is different, and each fixture must be tested and re-tested before we can label it safe for drinking. To see the status of drinking fixtures at your school, click on this chart and this schedule for when future work will be accomplished. We are now including a chart for the additional work done on classroom fixtures. These documents will be updated on a regular basis. Beverly Cleary Fernwood, and Martin Luther King Jr. School received new seismically strengthened roofs. These schools also received ADA improvements plus new fire sprinkler systems and fire alarm improvements. Lewis Elementary received a full seismic retrofit to bring it up to modern seismic code thanks to a seismic rehabilitation grant from Business Oregon. Lewis also received new fire alarm and fire sprinkler systems and ADA improvements. Health and safety work at Chapman Elementary and Jefferson High School included the removal and replacement of asbestos containing flooring throughout the building. Modernization work is also proceeding. The School Board has approved the master plan for the new Kellogg Middle School and construction begins this summer. Final design work continues at Madison High School and construction will begin this summer. Lincoln High School is nearing completion of its schematic design plan and at Benson Polytechnic, the master plan was approved and a decision has been made for Multiple Pathway to Graduation programs to remain at a modernized Benson. Construction at Grant High School continues and nearly all the exterior work on the new Grant is complete. Grant is the last project from the 2012 Bond and will re-open at the start of the 2019-20 school year. Based on the latest project budget projections from the modernization/rebuild projects the program is now $89 to $125 million dollars below the amount needed to deliver these projects as envisioned in the initial master planning phase. The Office of School Modernization is working with the School Board for opportunities and options to rectify the situation. PPS remains committed to deliver robust high school and middle school projects and to maintain the trust of voters in our community. The next Benson Tech DAG meeting is Thursday, April 25th at 6pm in Digital Media Studio - room E105. The Bond Accountability Committee (BAC) communicates key information related to the bond to the School Board, public groups, organizations and stakeholders. Significant community engagement and input remains a priority as we rebuild our schools. 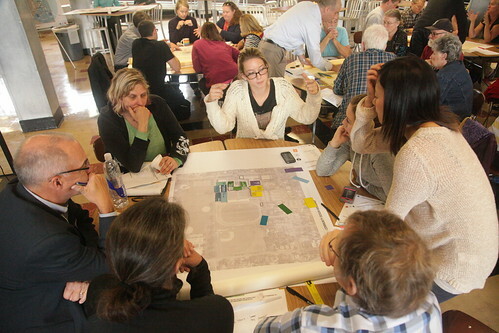 Public Design Workshops continue to provided students and school communities the opportunity to help shape the designs of the schools that will be modernized and rebuilt. Design Advisory Groups and Master Planning Committees comprised of students and community stakeholders also provide feedback for the PPS Design Teams. View the Grant Modernization Public Engagement Video. PPS has now replaced and brought back online the majority of drinking fountains and kitchen faucets in the common areas of most schools. These faucets now meet or exceed PPS water quality standards which are better than those mandated by the EPA. To see the status of drinking fixtures at your school, click on this chart and this schedule for when future work will be accomplished. We are now including a chart for the additional work done on classroom fixtures. These documents will be updated on a regular basis. In some cases, even after replacing the fixtures, tests indicate that more extensive work involving replacing plumbing lines in the walls may be needed. These faucets will remain off until this work can be accomplished. Learn more details at our Water Quality Page. The PPS School Board has officially approved the order of the middle school and high school modernization projects from the May 2017 Bond. Read the full PULSE story on the construction schedule for the May 2017 Bond schools here. Thank you voters for supporting the 2017 Health, Safety and Modernization Bond. The Office of School Modernization is continuing the important work of rebuilding our aging schools, making them all safer, and better equipped for 21st century learning. Check out the latest Bond project videos here. The $482 million, 2012 School Building Improvement Bond prioritized modernizing three high schools, rebuilding one K-8 school, as well as seismic and science classroom upgrades, increased accessibility, and new roof projects at 51 schools. The $790 million, May 2017 Health Safety and Modernization Bond will modernize or rebuild three high schools and one middle school. In addition, at least $150 million would go toward resolving health and safety concerns at schools across the district. Learn more about the Roosevelt project here. Learn more about the Grant Modernization project here. Learn about Benson Modernization here. Learn about the Lincoln Rebuild here. Learn about Madison Modernization here. Learn about the Kellogg Middle School Rebuild here. Learn more about the completed Franklin project here. Learn more about the completed Faubion project here. In June 2012, the Portland School Board adopted a ten-year school facilities plan. Learn more about the plan, and the process to develop it, on the Long Range Facilities Plan webpage.